My special guest today is a woman whose name is familiar to many of you. Welcome, Susan Haley. It’s just wonderful to have you as our guest today. One of your beautiful stories, titled simply Miracle, is published inTales2Inspire ~ The Topaz Collection. From what I understand, this is a personal story of a very special event in your life. Can you tell us just a little about how this miracle entered your life? I’ve always adored animals and when fortunate enough to live on a farm for eight years, I became totally enamored with bovines. Being a city girl all of my life, I spent hours every day after work sitting in the pastures amongst the herd of fifty or so heifers. I was mesmerized by their gentleness, their social order. Even the resident bull, Cowboy, was a good old bull, but extremely large. The story of “Miracle” tells the rest. Can you compare the emotions of that day to any other event you have ever experienced? To me, all life is miraculous. Miracles are not limited to human recipients. I’ve rescued, nursed and bottle-fed many little critters from baby birds to owls and kittens to raccoons. They all gifted me with the joy. But in Miracle’s case especially, it was me who was gifted. Miracle was intended to survive and I was allowed to be the tool in that new life. I loved him like my child. What a phenomenal experience that must have been! From the pictures included with this story, it appears that you and Miracle really bonded. Tell us about your relationship with Miracle. How long did it last? In Miracle’s mind, I was his mother. 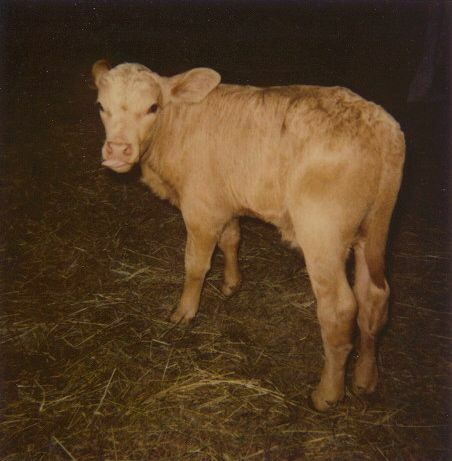 I’d walk him to the pasture on his harness to see the other calves and he’d want to play with them, but when a big cow approached, he’d jump behind me for protection just like any other child would do. He had no ‘mama’ to teach him how to be a cow and it became my privilege to attempt the task. You might say that my hours of observation of heifers with their babies schooled me in what I needed to do until his own bovine instincts kicked in to guide me. Still, even when he grew and joined the herd, all I need do was walk to the hill, call his name and he’d come running to see his ‘mama’. I don’t have the space here to explain why the daily togetherness lasted but five years. Perhaps sharing his size will be enough . . . think in tons. It’s in the novel. Also, a dear friend and mentor of mine, Bob Delany, wrote a poetic story about Miracle that can be found on my website. Bob wrote the poem based on my accounts. It is absolutely beautiful. That’s great Susan. I’m sure some of your fans would love to read that poem. We’ll add your website info at the end of this interview. But first let me ask you a few more questions. Tales2Inspire ~ The Topaz Collection is all about personal awakenings and aha moments. Why do you think your Miracle story is a good fit for that particular collection? My actual ‘aha moment’ came with the awareness of all life being Created special, ALL life, from the Cosmos, the trees and flowers, to earthworms. 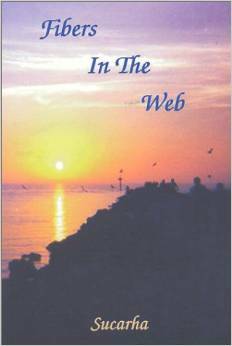 My first book, Fibers In The Web shares my philosophy about these awakenings. In telling about Miracle, I hoped to share that joyful awareness with others. If one doubts the essence of Soul, all one need do is gaze deep into the eye of a cow munching a cud in a green meadow. There, deep in that eye, you will find where utter peace dwells. The same holds true in the eye of a dolphin, a horse or a dog. In that place, despair and pain can also be found. It really struck me full force when I saw a tear slide from the eye of an elephant at the loss of its best friend. I understand you included that story in your full length novel, Rainy Day People. If you were giving us an elevator pitch for Rainy Day, how would you describe that novel? Rainy Day People is about a journey called Life. It embraces the beauty and the ugliness, the ups and the downs, the despairs and the joys of all that turmoil. This maelstrom of experience is what lets us know we’ve lived on this Earth for a time. I’m not, however, pitching. Life is for everyone to do with what they allow themselves to believe they can. Well, it’s clear to everyone who meets you that you are a spiritual person. No wonder you are a Tales2Inspire repeat performer, winning an award two years in a row! You seem to like one word titles. Tell us the title of the one which is in the Tales2Inspire ~ Sapphire Collection. And once again, please give us your elevator pitch for this inspiring story. The pitch would be sufficed by the one above for Rainy Day People. All my writing is about life and ultimate love. Doorways is but a compartmentalizing of my journey. I find it to be something worth sharing, especially if you’d like to have a smile. Yes, your sense of humor comes through in parts of this story, but it is also quite sobering and powerful at times. Your writing almost reads like poetry. Do you in fact write poems as well? If so, have you published any? Poetry is my first love. To me, it’s the most simplistic and basic way of expressing my very Being . . . mind, body and spirit. I’ve written poems for six decades beginning when I could first hold a pencil. Some were for my eyes only, others for those close to me, still others with a personal profundity that have been humbled with awards. I’ve lost count of how many have been published, several plus a book. The one I’m most proud of for its message is “The Circus Is Coming To Town” which was made into a children’s e-book. If anyone needs the education, it’s the children. What is your favorite poetic device and please give us a couple of examples of how you used it in Doorways? Metaphor and imagery. In Doorways, the title itself is a metaphor. The story is full of them. You can almost pick any paragraph and find a couple metaphorical comparisons. I want my poetry to be understood by everyone who reads it; I think metaphor is paramount in accomplishing this. We are all familiar with the word ‘parables’. Parables are used in teaching by verbal illustration. Parable and metaphor are near synonymous. I use it in both my poetry and my prose, even my non-fiction journalism. Why am I not surprised by your favorite devices! You crafted metaphors so beautifully in Doorways. Any other awards in your illustrious writing career? I do believe you’ve covered them all in the biography provided in my contributions to the Tales2Inspire books. I’m not one for talking about my accomplishments hoping that the work will stand on its own. I understand you have your own history of helping other authors. Tell us about that part of your life. I love helping new authors, as well as seasoned authors, craft their new endeavors with only a few exceptions such as horror, I won’t work with that. I facilitated the Sarasota County chapter of the Florida Writers Association for near seven years just so writers could mingle with other writers. The talent out there is amazing. Some of the very best books I’ve ever read are written by unknown authors, one Civil War novel even nominated for a Pulitzer. So, I edit, urge and attempt to guide an author not just from the eyes of an editor, but from a reader with a passion for the art. I’ve written articles, crafted networking plans, given workshops and basically done what I can do within my own limited abilities. As part of the original group of Authors Helping Authors, I like to remind all writers to support the work of their fellows as well as ‘pitch’ their own. Susan, I’d like to shout your last sentence from the rooftops. Authors Helping Authors has been my mantra ever since I began taking myself seriously as an author. And there are so many ways we can work to support one another. Thank you for reminding us all of how important and rewarding that can be. ‘Miracle” was one of my favorite stories in the “Topaz Collection” and one I singled out in my review of the book. While all of the stories are special, sometimes one just grabs your heart. I certainly enjoyed this interview with the author. Thank you, Micki, for your kind comments about Miracle, one of th stories with a life inspiring message in Tales2Inspire ~ The Topaz Collection. 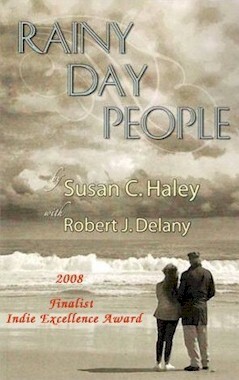 Susan Haley is indeed a fabulous author, one I often recommend for editing services. Actually two of my Tales2Inspire authors have used her services and were both thrilled with the results. Thank you so much, Micki. I apologize for being slow in response to your kind remarks about Miracle. I’ve been away from the computer a lot lately due to some family health issues. Knowing my sharing of the Miracle story has even one person’s attention is so humbling to me. Ah-ha, the rest of the story is a secret . . . That is, until you read it in the book! Available in Kindle and soft cover formats. You might want to go to:www.tales2inspire.com and click on FREE GIFTS at the top of the page to get some sample stories. So glad you are enjoying this site, Madison. Do come back and visit again . . . and again. Something new is posted weekly.